Trim styles in homes will vary by taste and design. But, regardless of design choices, trim work installations should always be held to a high level of standards. 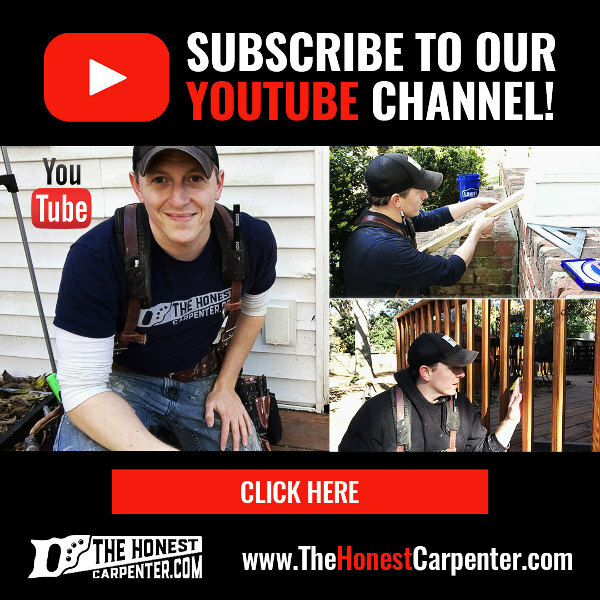 This article from The Honest Carpenter will show you how to identify quality trim work in a home. By focusing on five elements in particular, you will be able to “read” any trim installation like a pro carpenter! Here the crown mould has been returned towards the cabinet face. “Returns” are small pieces of trim that create a visible termination for a longer piece. 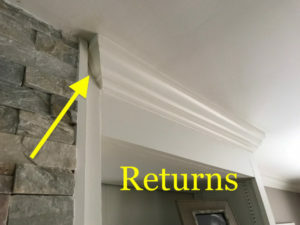 Essentially, returns give the impression that the trim has turned a corner and vanished back into the wall. 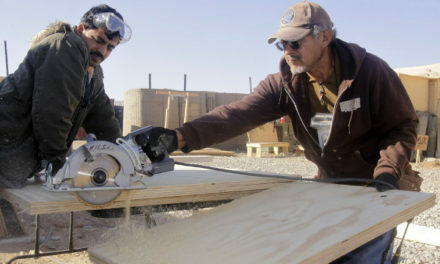 In these areas, carpenters will cut the end of the longer piece at a 45 degree angle, and then cut a tiny piece at an opposite 45 degree angle. When these two pieces are glued and pinned together, they create an outside corner of their own. 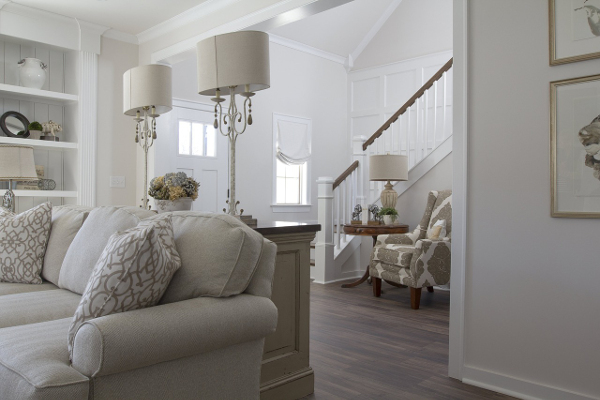 This effect is very visually pleasing, and adds an appearance of completion to the trim in a room. 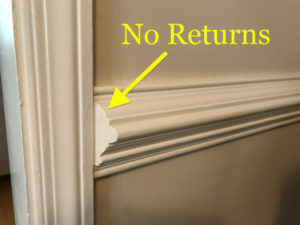 For trim as large and protrusive as crown moulding, returns are absolutely necessary to create a finished look. However, it is also laborious and time-consuming to cut and install returns. So, for smaller pieces of trim (such as the chair rail below), carpenters will sometimes take a shortcut and simply put a “back miter” on the piece. Back-miters are a weaker substitute for returns. This is a cost-saving measure, and is actually extremely widespread and acceptable in residential construction. But, it reduces the aesthetic quality of trim in a room. For high-end trim work, returns should always be installed. 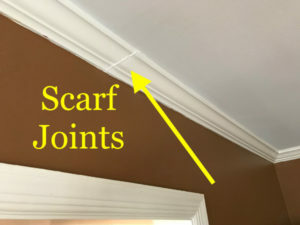 Scarf joints are a way of bringing two pieces of trim together so that they look like one long, continuous piece. On sections of wall longer than 12′ or 16′, scarf joints will be utterly necessary because lumber does not come in pieces beyond these lengths. Scarf joints should be smooth and unnoticeable–unlike this one! In order to create a decent scarf joint, the two conjoining pieces should receive miter cuts in the same direction. This allows the pieces to “overlay” one another seamlessly when pushed together (pictured below). Though relatively simple in concept, a smooth scarf joint can be hard to achieve. Bulges in the wall or ceiling, or twists in the trim lumber, can interfere with the joint, causing the two pieces to pry away from one another. 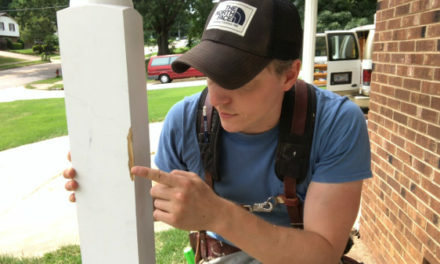 For this reason, good trim carpenters will often make sure that a scarf joint “breaks on a stud” — meaning that the joint occurs directly over the position of a stud in the wall. This allows the carpenters to drive a nail through the joint and into framing lumber behind it, firmly trapping the two pieces in place. 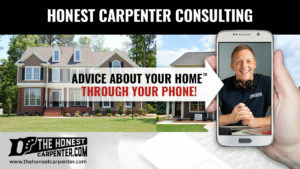 Carpenters will also take the extra measure of glueing the end grain of the two pieces to further ensure that they don’t split or move as the house lumber expands and shrinks throughout the year. 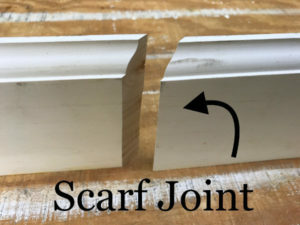 Basically, the rule of thumb with scarf joints is that if you see more than just the faintest trace of a seam, the joint could have been cut or fastened a little bit better. “Reveals” are among the most overlooked and understated elements to be found anywhere in architecture. At some point I’ll devote a whole article to them — I really think they’re that important! But, for now, a simple explanation will do. Reveals are small offsets between two parallel trim pieces. The reason these reveals are so important, though, is because they hide irregularities in the edges of the two trim pieces. If you were to remove the reveals and bring these casing edges flush with one another, you would see that neither is truly straight or clean! The two pieces would wander inward and outwards and away from each other by tiny degrees. Their imperfections become that much more obvious when set starkly against one another. Even a reveal too small will show problems over a run of just a few feet. 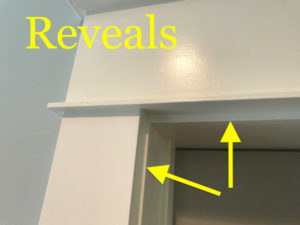 The reveal in this doorway is too small. So, reveals are sort of an ingenious way of solving a problem by creating a bigger imperfection. By just sliding the edges of the two pieces away from each other (usually about 3/16″), the minor differences get lost, and a pleasant-looking complexity appears in the trim casing. 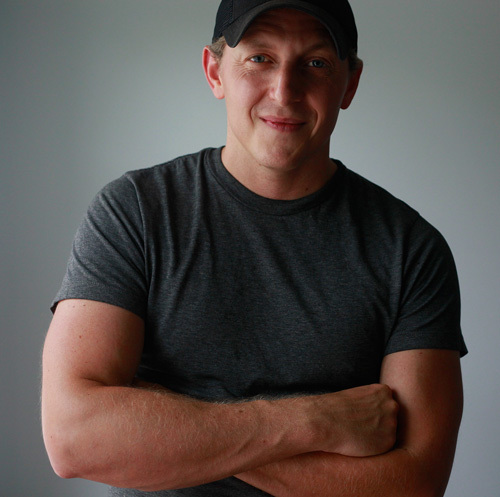 Understanding reveals really helps you understand the whole world of trim carpentry. Elaborate trim profiles, especially around ceilings, can be achieved by creating a series of built-up offsets and reveals from numerous smaller elements. 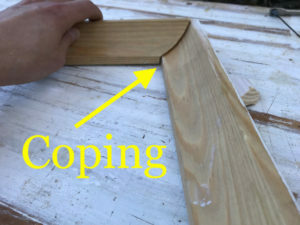 Coping joints, or “copes,” are a type of joint used to bring two trim pieces together in an inside corner. Like returns, copes are an indicator that a higher level of attention and skill have been brought to a particular job. For most inside 90 degree corners, two 45 degree miter cuts (one on each piece) are all that’s really required to create bring two pieces together. 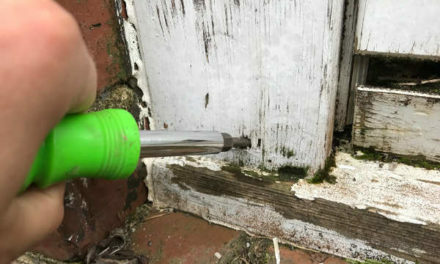 But, discrepancies in the corner angle, and seasonal movements, can cause such mitered joints to “open up” over time, if they even install cleanly to begin with. Carpenters neutralize some of these problems by using coping joints to bring two pieces together. This cove mould has been “coped” to create a 90 degree corner. For a cope, the profile shape of the trim being used is cut onto the end of one piece, which allows it to slide like a puzzle piece against the surface of the trim piece it’s meeting (pictured above). Making copes is very laborious compared to cutting simple 45 degree miters. But, good trim carpenters will cope virtually every inside corner in a house just to ensure a good fit. The irony is that it’s almost impossible to distinguish between a miter joint and a coping joint once caulk is on! Only on jobs where a stain finish (instead of caulk or paint) is used does the difference stand out prominently. Still, if you’re hiring trim carpenters for a project, be sure to ask them in advance if they cope their corners or miter them. Copes will stand the test of time better, and they also show that you’re dealing with someone who prioritizes craftsmanship over speed. 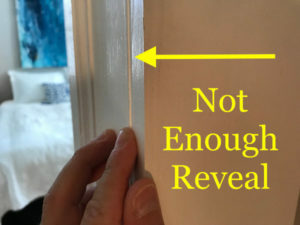 Probably the easiest trim details to spot in a house are “fill-ins”–or, more importantly, the lack thereof! Fill-ins are tiny pieces used to fill small natural gaps on a wall, mainly around doorway casings and in awkward little inside corners. In some of these situations, the gap is hardly bigger than the thickness of the casing itself. 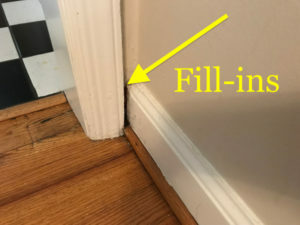 In high-speed trim installations, carpenters will often just terminate the end of a trim run straight into the gap and fill the remaining space with caulk (if they even bother). Ideally though, this gap should be treated like every other inside corner in the house and receive a tiny fill-in trim piece of it’s own. The longer run meeting it can then be coped for a good fit, and what you’ll have is a clean looking corner, rather than an eyesore. There are countless details that distinguish a quality trim installation from an inferior one. But, these five represent the most common — and I feel most important — carpentry considerations in trim work. If you’re looking at homes to purchase or rent, just run your eyes over the trim and casings. 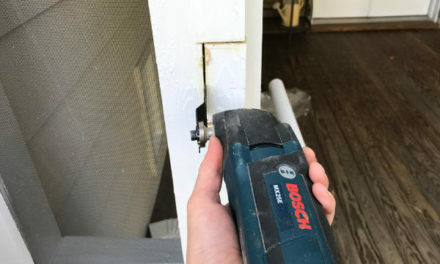 By honing in on these five key points, you’ll be able to read the story of how well the trim was installed in a matter of moments!